Garden decorative string lights shaped with 30pcs high simulated honey bees,when you use the string lights decorating the trees and flowers, it looks like some lively honey bees on the flower. Simulation honey bees string light with waterproof design, honey bees is made of hard plastics,can work at rainy weather conditions, no essy to be damaged. Honey bees solar string lights can be used for garden decoration,Outdoor Xmas Decorations, also can twine with other string lights, such as peach blossom string lights,increase Spring atmosphere. Warm white LED for string light, warm color for honey bees decor,warm atmosphere for your garden and home, especially for Thanksgiving and Christmas Day,also other festival. During the day, the solar panel converts solar power into the recharge battery. At night, the lights turns on automatically using the stored energy. But you must put the solar panel in the place where it can face the sunlight directly. And there is a sensor inside the panel, if the panel is under light at night, the lights will turn off automatically. So it should not be placed near lighting such as street lights. Solar Power: The bee lights are operated by the solar power. It need not to be plugged into the socket or battery. The solar panel (included) is totally eco-friendly. 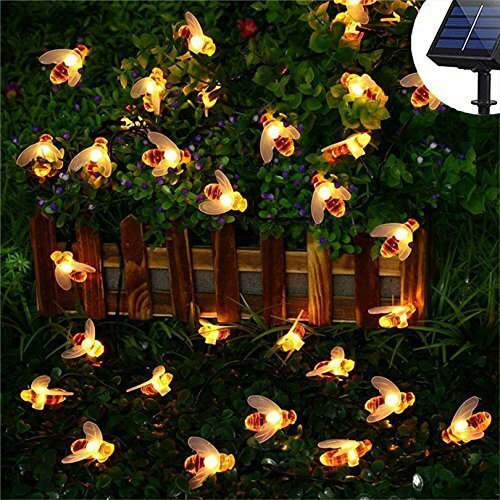 Honey bees decorative solar string lights is great for garden decorations,outdoor Xmas decorations and tree/flower decoration,can twine with peach blossom string lights, very beautiful. Add warm and charming atmosphere to your patio, balcony, lawn, porch, yard, fence, gate, tent, camp, BBQ, party decor. 2 Modes and Durable: Steady on and twinkling mode. High temperature resistant and corrosion resistant, ideal solar lights outdoor to decorate your backyard, garden, home, patio, fence, tree, grass, flowerbed, festival, balcony, wedding and party. Waterproof: All the bee string lights are waterproof, so that it can work in a rainy day. Great for indoor and outdoor. These lights are suitable for using in conditions where dust, rain, spraying water, snow or forest exist. Easy to use: It will turn on at night, and turn off in the daytime to recharge automatically. The solar panel must face the sunlight directly. If you have any questions about this product by KORADA, contact us by completing and submitting the form below. If you are looking for a specif part number, please include it with your message.